Assembling Artifacts Of African-American History In a vast warehouse off an undistinguished highway in Maryland, storage cartons and suitcases hold the treasures of the as-yet-unbuilt National Museum of African-American History and Culture. 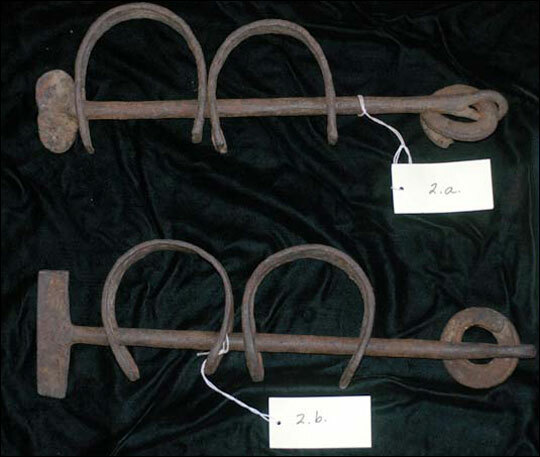 This rusted set of slave shackles is a chilling artifact left over from the 18th-century slave trade. 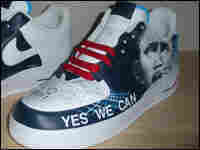 The museum's collection of Obama-themed artifacts includes these sneakers, which were donated by the artist, Van Taylor Monroe III. In a vast warehouse off an undistinguished highway in Maryland, storage cartons and suitcases hold the treasures of the as-yet-unbuilt National Museum of African-American History and Culture. Part of the Smithsonian Institution, the museum won't be completed until 2015, but its small, dogged staff is already busy gathering artifacts. 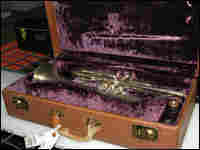 Some of the items — like the 1927 trumpet that once belonged to Louis Armstrong — are objects of celebration and triumph. Others — like the two rusted metal cuffs attached to a long bar — bear witness to a history of cruelty and suffering. "There's hardly enough room for a leg," says chief curator Jackie Stirwhir, describing the chains that were once used to hold slaves immobile during the long sea passage from Africa to the New World. "They often walked around with the flesh of their legs raw because this metal would rub against their legs. ... It was an instrument of torture." But museum director Lonnie Bunch sees something else in the shackles. He calls them a "sacred object" and explains that they tell the story of a people forced to start anew in a place that didn't see them as human. "This is going to allow us to tell one of the most difficult stories in America, but tell it in a way that helps people understand that the slave story is the quintessential American story," he says. "This is the story that ... brought millions of people to a new world and changed the way this country would be." Bunch says he makes a point of touching the shackles every day he can. The experience, he says, is "the closest I come to understanding my slave ancestors." But, Bunch adds, the museum isn't just for the descendants of slaves: "Whether your family's been in this country 200 years or 20 minutes ... I want you to come to this museum and say, 'I get it. This is not a black story. This is my story. This is the American story.' "
Part of the 21st-century American story the museum staff is eager to tell is that of the nation's 44th president, Barack Obama. After Election Day, staffers scrambled to gather memorabilia from an Obama campaign office in Falls Church, Va. Included in the haul? Magic marker "Kids for Obama" signs, a beat-up brown corduroy La-Z-Boy chair and — arriving any day now — a chalkboard signed by volunteers at the Obama office in Wasilla, Alaska. Bunch says the election of Obama epitomizes the museum's goal to refine and clarify what it means to be American: "He has claimed his 'Americanness' without being shy, without saying 'I'm a black American,' saying [instead], 'I am an American who is African-American.' 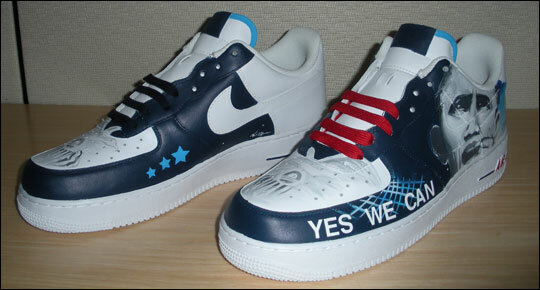 "
So does the election of a black president negate the reason to have a separate museum on African-American history? "Not at all," says Bunch. "First of all, the election of one person doesn't mean that race is no longer an issue, doesn't mean that we've resolved every issue. And even if we did, to understand how we got there — that's what this museum will help you understand." And though the history of African-Americans is steeped in tragedy and brutality, Bunch insists that the museum is much more than that. "The African-American experience has never simply been about tragedy," he says. "It has really been about difficulty and resiliency, tragedy and optimism, opportunity, belief in a world that didn't want you to be equal — but you believed that you were equal."